Another year in China, another short holiday for Tomb Sweeping Day, and another short trip to a cultural and historical city. In April 2013, we went on a little Beijing family outing to Datong in Shanxi province. The two of us plus Pip, Sean and Alex all took the overnight train together from Beijing; it was us five lao wai plus one poor Chinese girl sharing a 6-bunk hard sleeper cabin. Being the classy folks that we are, we brought along some wine and cheese for the ride. Arriving in Datong in the morning, we first found our hostel, which was strangely located above a baby-clothing store. 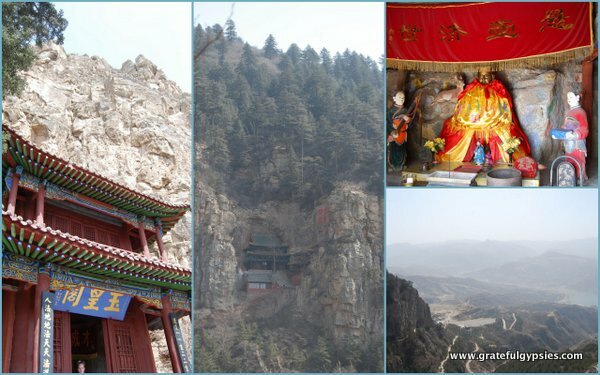 After finding some coffee and a quick lunch, we hopped on the bus bound for the Yungang Grottoes. 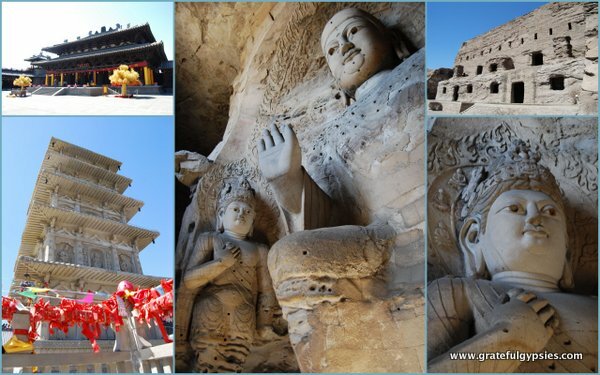 There are three great Buddhist sculpture grottoes in China. Since we had already been to one in Luoyang, we decided to check another off the list and bring some friends along. We all spent the afternoon wandering around the grounds, checking out the thousands of Buddha images carved into the rock. 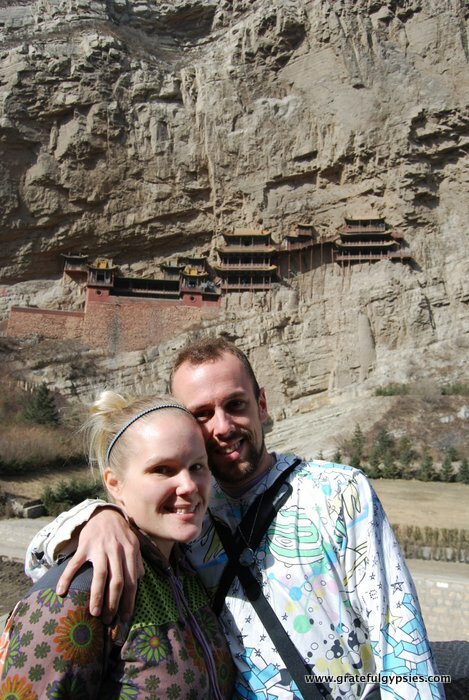 The Yungang Grottoes of Datong. Take a video tour of the Grottoes with us! Back in the city, we walked around a bit – through a square full of roller bladers, past the Old Drum Tower, around the Grand Mosque, and eventually to the Nine Dragon Screen. Looking around Datong, it was clear that this city was undergoing some serious construction. Cranes were everywhere, and many of the main roads were torn up. Even a part of the City Wall was nothing but a pile of bricks at one point. Part of it is open, though, so we bought a ticket and walked along as far as we could, looking down at the old city on one side and the quickly developing new city on the other. Some scenes of Datong city. Panorama from the City Wall. 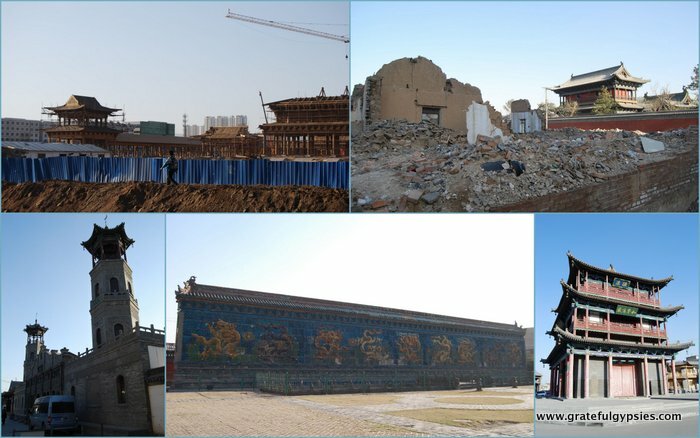 We later learned that while Datong is being remade, it is ancient structures that are being repaired and rebuilt, rather than new skyscrapers and office buildings. This seems to be a smart move on their part – restore some of the city’s history and culture while bringing in more tourism RMB at the same time. Hopefully other places in China follow Datong’s lead and restore more ancient structures instead of tearing them all down to make room for malls and KFCs. 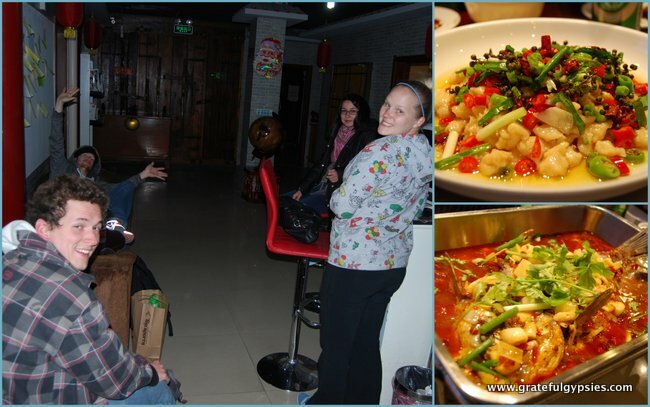 With tired legs and rumbling bellies, we all sat down in the first decent looking restaurant we could find, where we enjoyed a huge dinner of spicy Sichuan food. Much to our delight, we even found PBR in a local shop, and we brought a few back to our hostel where we just hung out for the night. The next day, we hired a car to take us out to the incredible Hanging Monastery. This temple, which combines Buddhism, Taoism, and Confucianism, was built over 1,500 years ago right into the side of a cliff, 75 meters above the ground. Walking around in the temple results in a bit of vertigo, and it might be a bit creepy if you’re afraid of heights. It’s certainly a sight to behold, though, so even if you’re scared, at least check it out from down below. From the Monastery, it’s just a few more minutes up the road to Mt. Heng, one of China’s Five Great Mountains. Although it’s the least religiously important of the five, we thoroughly enjoyed our afternoon hiking up the mountain, stopping in the various temples to look around. The fact that it’s not so important amongst Chinese tourists made it a much more relaxing trip than my climb up Mt. Tai in Shandong, which is always packed full of tourists. One of the holiest mountains in China – Mt. Heng. Check out the Hanging Monastery and Mt. Heng in this video. Back in the city again, we all had dinner in a ma la xiang guo place. For those not familiar with real Chinese food, let me paint a picture for you. Basically, you walk up to the counter and order up whatever you want, choosing from various meats, vegetables, seafood, noodles, and more. Then, they cook it all up for you with spices and seasoning, and they bring it all out to you in one big pot. It’s cheap, delicious, and a fun group dining experience. That night, we took over the local pool hall, where we shot a few games, had some drinks, and eventually got a private KTV party going. Win and Erica showed up late having driven from Beijing, and we all drank and sang the night away. Before leaving, we paid a visit to the Huayan Monastery at the end of the pedestrian street. Some of my students had told me to go there, as they had painted some of the walls on a field trip with their art school. This temple was originally built hundreds of years ago in the Liao Dynasty as an ancestral temple for the imperial family, and it was given a huge facelift in 2010. From atop the large pagoda, we looked out at the old city – much of it nothing but piles of rubble – and wondered what would become of this place in the future. Every time we travel in China, we’re reminded of the insanely fast pace of development here. We just hope they can manage to maintain their fascinating culture in their rush to modernize. Looking down from the Huayan Monastery. Walk along the City Wall and tour the Huayan Monastery. We’re glad we took the time to visit Datong, and we’d definitely recommend it for a short trip outside of Beijing. Alternatively, if you’re traveling through China, you could include a stop here and another in Pingyao to see some of the best of Shanxi province. Transportation: There are a bunch of trains that connect Beijing to Datong every day, each taking between 6-7 hours. 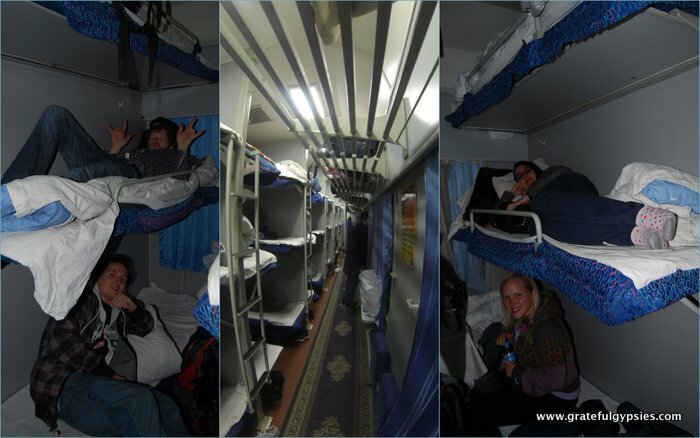 We took the overnight train and got hard sleeper tickets for 100 RMB each. Get Around: You can just walk around the old city very easily. To get to the Grottoes, you can take a local bus for just 1 RMB. For the Hanging Monastery and Mt. Heng, it’s best to hire a driver for the day. Our group of five paid 75 RMB each for a mini-van. Accommodation: We stayed at the Datong Youth Hostel, which is the only hostel in town. Our double room was 160 RMB/night, while my brother got a bed in the dorm for just 50. It was in a good location, the room was decent enough, and they helped us get a driver for the day. Activities: In the city, there are a few temples to see, in addition to some nice squares where locals like to hang out. 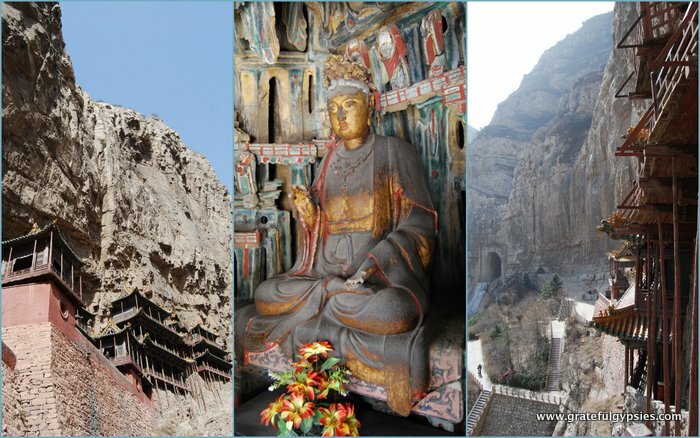 The main attractions, however, can be found outside of the city – the Yungang Buddhist Grottoes, the Hanging Monastery, and Mt. Heng. You can also walk along the recently rebuilt City Wall. Food/Drink: Noodles are the specialty in Shanxi, so you’ll find them everywhere you look. Along the pedestrian street with the hostel, there are a bunch of street food vendors from afternoon to night, as well as a handful of different restaurants. For nightlife, you can find a few bars, play some pool, or of course sing your heart out in a KTV. Recommended Time: If you get in early in the morning, two full days should be enough – one for the Grottoes and the old city, and another for the monastery and the mountain. This makes it a perfect spot for a long weekend, which most people who work in China get for a few holidays (Tomb Sweeping, Dragon Boat Festival, or Mid-Autumn Festival).